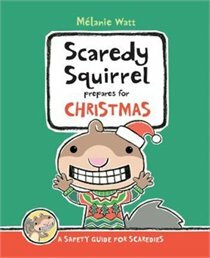 My first introduction to Scaredy Squirrel is sweet and too brief, much like the holiday season. This guidebook gives examples of many different things that one could worry about during Christmas, from crafting to tinsel garland. Author Melanie Watts is able to squeeze a decent amount of material out of the idea of being afraid of the holiday. I particularly enjoyed the lists of red things to avoid decorating with (dynamite, chili peppers) and green things to avoid decorating with (Martians, poison ivy). 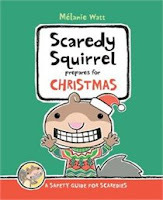 Fans of the series will love this new addition, first time readers will want to know more about this cowardly squirrel! Infamous bully Niko Kaylor is back and the new student at a hippie school where the only rule is "no bullying". Rather than giving up his ways, he decides to go undercover and cyberbully his classmates. I was really excited to get my hands on this book, as my students are greedy for anything that is written as a humorous confession: Big Nate, Diary of a Wimpy Kid, Dork Diaries, etc. And even though I didn't really enjoy Journal of a Schoolyard Bully, it doesn't matter because they will be clamoring to read it. Unfortunately, this felt like a cheap imitation of those other books; it wasn't as funny and the undertones were a lot darker. Niko's relationship with his father is especially sensitive, and goes a long way to explaining his pathos. Still, my opinion doesn't matter because Journal of a Schoolyard Bully will never see shelf time. I won't be pressing it into the hands of my students, but they will find it anyway and probably love it.